John David McAfee is an American computer programmer and businessman. He founded the software company McAfee Associates in 1987 and ran it until 1994, when he resigned from the company. McAfee Associates achieved early success as the creators of McAfee, the first commercial antivirus software, and they now produce an entire line of enterprise security software. The company was renamed to Intel Security in 2011 after being purchased by Intel, though the software still retains the McAfee brand name. 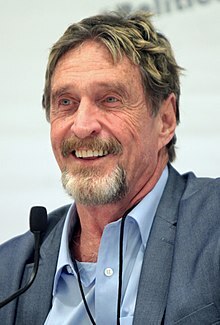 McAfee's wealth peaked in 2007 at $100 million, before his investments suffered in the global financial crisis that began that year. John David McAfee (/ˈmækəfiː/ MAK-ə-fee; born September 18, 1945) is an American computer programmer and businessman. He founded the software company McAfee Associates in 1987 and ran it until 1994, when he resigned from the company. McAfee Associates achieved early success as the creators of McAfee, the first commercial antivirus software, and they now produce an entire line of enterprise security software. The company was renamed to Intel Security in 2011 after being purchased by Intel, though the software still retains the McAfee brand name. McAfee's wealth peaked in 2007 at $100 million, before his investments suffered in the global financial crisis that began that year. He is also a political activist, who sought the Libertarian Party nomination for President of the United States in the 2016 election, losing to former New Mexico governor Gary Johnson. McAfee also has interests in smartphone apps, yoga, and all-natural antibiotics. He resided for a number of years in Belize, but after several disputes with the authorities in Belize and Guatemala, he returned to the United States in 2013.